In Astral Tournament duel you fight the other mage (PC or other player) for control of magical plane using creatures and other spells. The creatures and spells are of the following magical elements: Air, Fire, Water, Earth and Death. Each mage starts the duel with 50 life points. Each mage has five more numbers - they show his power in the appropriate magic element. 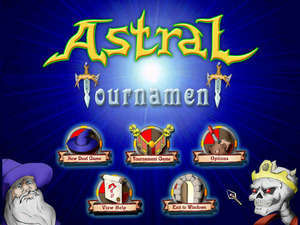 Astral Tournament 1.5 is a shareware program and can be used as a demo to try the software until the free trial period has ended. A full version of the program is available after the trial period ends. For security reasons, you should also check out the Astral Tournament download at LO4D.com which includes virus and malware tests. Additional screenshots of this application download may be available, too. Astral Tournament has a presence on social networks.